One of the biggest kept secrets in LED grow lights towards growers is probably how specific spectra are made with a combination of LED packages. As learned in the chapter More micromoles for less $$ there can be tremendous differences on the energy efficacy depending on the LED packages technology used, as well as on applying the correct light spectrum by avoiding micromoles and watts where you don’t need them. A horticulture grow spectrum “one does it all”, mainly means that you are going to get a neutral spectrum like mimicking the sun which goes under many nicknames like “broad spectrum”, “sun spectrum” and many more variants. When you are aware that every crop is different and has different needs in different growth stages, also with regards to lighting, than you know already that you are wasting a good portion of the needed energy to make that spectrum and the related micromoles. That’s why we aim at a multitude of specific light spectra, each with its individual characteristics and field of use. Under the various subtitles of Science behind Horti LED Grow Lights we have pointed out already some advised spectra per kind of crop and growth stage. Still we advise you to get in contact with our experts once you are thinking about applying LED grow lights in your project, as small changes can make big differences. All MechaTronix grow spectra are achieved by the patented CoolGrow® LED horti light engines, which can be applied on numeral LED grow lights like the CoolFin® and CoolStack®, each producing a PPF up to 1.950µmol/s at a market leading 2.7µmol/J efficacy with 4 CoolGrow® LED engines. But also smaller systems like the CoolBay® with a single CoolGrow® LED engine of up to 487µmol/s are off-the-shelf available. The CoolGrow® is a complete new approach in horticulture LED lighting, and is developed according the Zhaga standard for future upgradability. The Zhaga consortium came to life with the idea of compatibility standards between luminaires – it has never been deployed yet in horticulture lighting but why not? – Also horticulture LED engines will keep on developing over time at a speed even much faster as these for white lighting – When we look back we see that the efficacy in horticulture LEDs has been increased with over 50% in just the last 18 months – that means that you could run your grow light LED installation today at 35% less power consumption than the grow lights you bought just over a year ago! And that’s what makes the CoolGrow® unique – at any time in the future the LED engines, which count for less than 25% of the total cost, can be upgraded to the technology and efficacy of that time. This is the most frequent used spectrum in a variety of mature crops promoting flowering, budding, leaf building and a good biomass production. Ideal for cannabis flowering stage and multiple leafy greens. Very strong results with high crop cultivation like tomatoes, cucumbers, bell peppers and egg plants as well with a wide variety of berries. This spectrum is interpreted by the human eyes as clear white and creates an ideal light atmosphere for visual inspection. With a slightly higher focus on hyper red 660nm and limited photons in the blue and green to yellow spectrum, this growth recipe goes ideal for plants which you want to elongate during maturing. The recipe promotes longer stems and internodes, leading to an open plant structure and a higher ratio of photosynthesis. Most potted plants give a great result under this spectrum. 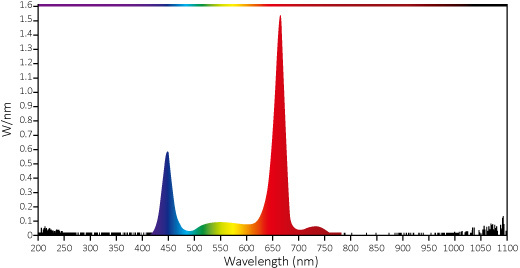 This spectrum is interpreted by the human eyes as warm white and creates a good light atmosphere for visual inspection - human eye response similar to SON-T.
With additional photons in the far red spectrum 730nm and a clear focus on the 660nm bandwidth this spectrum is ideal for ornamentals and a wide variety of floriculture supplemental lighting. The extra far red photons simplify controlled timing on flowering. Ideal for plants who don’t like too much blue spectrum like Phalaenopsis. 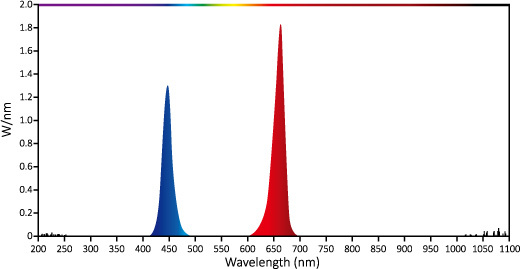 An energy wise very effective spectrum with only focus on deep blue 450nm and hyper red 660nm (12% to 88% ratio). This is a typical general purpose spectrum, which works ideal with a wide score of crops and particular with leafy greens. 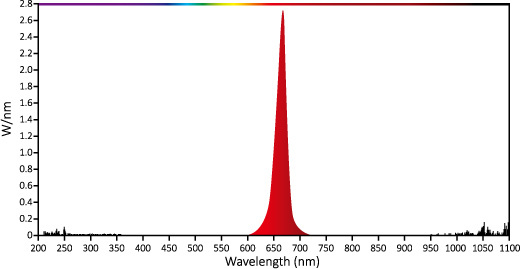 Althought frequently promoted for greenhouse cultivation, keep in mind that for the human eye response this spectrum is interpreted as red-purple and may complicate visual plant inspection. With a clear focus on the deep blue 450nm and hyper red 660nm spectrum, this recipe focusses on vegetative growth phases and propagation. The recipe delivers shorter, compact plants with a good biomass ratio – the extra energy in the blue 450nm bandwidth also promotes stomata opening. All together a good balance between both photon levels guarantees a good mix between vegetative growth and biomass production. Again a clear target on the deep blue 450nm and hyper red 660nm spectrum, this recipe focusses on vegetative growth phases and propagation. 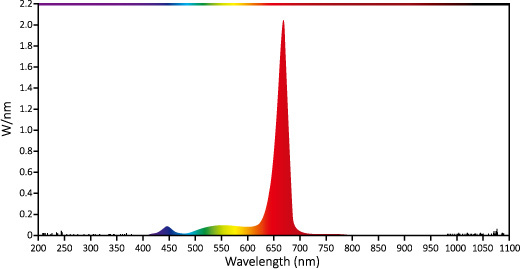 The extra photons in the far red 730nm spectrum enhance the transition period from vegetative growth to flowering. Ideal for cannabis vegetative growth and a wide score of ornamentals. 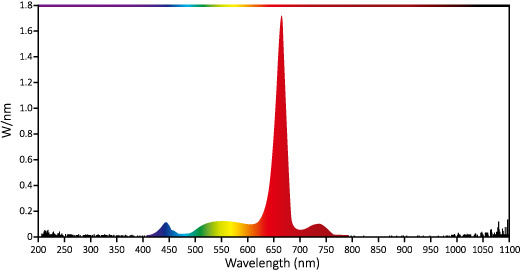 A clear high efficacy spectrum with balance between deep blue 450nm and hyper red 660nm (30% to 70% ratio). Focus on vegetative growth for plants which you don’t want to elongate too much. Very good results with a variety of algae like spirulina and Arthrospira. 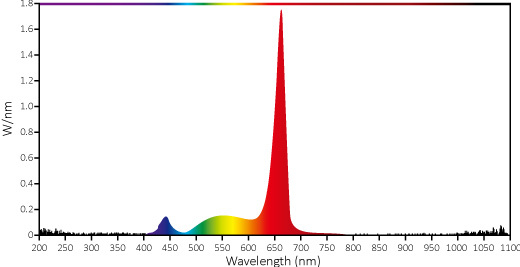 With the bulk of the photons in the hyper red 660nm bandwidth, this spectrum goes ideally together with hybrid lighting systems in combination with HPS SON-T luminaires. 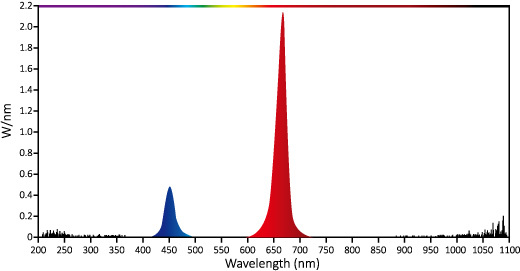 While the vast majority of photons from a SON-T are produced in the 550nm to 630nm this growth recipes used as a supplement will create more elongated plants with a higher biomass, longer stems, longer internodes and an overall open morphologic structure. 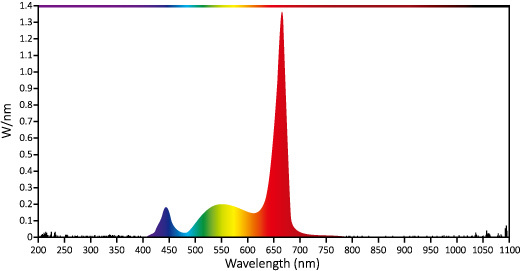 We recommend this spectrum in hybrid systems with HPS lamps for floriculture products like chrysanthemum. With all the photons bundled on the 660nm bandwidth, this spectrum is designed either as supplemental spectrum to HPS SON-T grow lamps, as well as to be used as spectrum controls supplement for adaptive spectrum over growth stage. Both the CoolFin®, CoolStack® as CoolPack® LED horti top lights allow dual channel spectrum controls. Various CoolGrow® growth recipes can be placed together on the same grow light, and each pair can be individually addressed. Suppose that you want to aim at various growth stages without changing the plants from location or changing the luminaires, for example the Sea of Green (SoG) cultivation method for medicinal cannabis, than this platforms let you combine 2 engines focusing on vegetative growth with 2 engines purely focusing on the flowering stage.